Brother ashrafh, aka Hasan Ashraf, was kind enough to share with us an important book of comparitive fiqh that argues the Shafi’i stance on legal issues, highlighting the legal contentions that existed between the Shafi’i and the Hanafi (or as Imam Bayhaqi terms it, the “Iraqi”) schools. The book that brother Hasan provided is an abridged form of Imam Bayhaqi’s (384-458 AH) original work, entitled al-Khilafiyat, which is also available in pdf format and has been uploaded here as well for those who are interested. Unfortunately, however, the original book has not been published in its entirety and only the Book of Purification has been published so far, albeit in three large volumes. I have heard that the muhaqqiq has completed the tahqiq on the rest of the book, but I cannot confirm this. I cannot be sure that the entire book is even available in manuscript form, although I have not read otherwise. The abridged book, entitled Mukhtasar Khilafiyat al-Bayhaqi, is the work of Imam Ahmad ibn Farah al-Lakhmi al-Ishbili (d. 699AH), and due to the extensive notes on the differences in manuscripts and hadith referencing, the abridged version covers five volumes. The book is a must for all students of the Shafi’i madhhab, particularly those who are interested in the early legal argumentation that took place between these two major schools of fiqh. 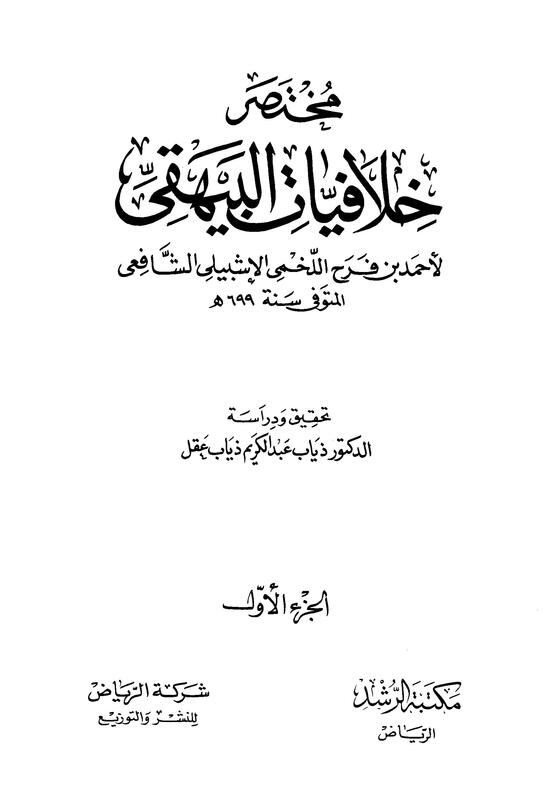 For a similar work by a scholar contemporary to Imam Bayhaqi and from the opposite viewpoint, one should read Imam Quduri’s (362-428 AH) al-Tajrid, recently published under the name al-Mawsu’ah al-Fiqhiyyah al-Muqaranah: al-Tajrid. This book, like Imam Bayhaqi’s al-Khilafiyat, is a much neglected reference amongst students of the Hanafi school. I have provided a link to the tenth volume of Imam Quduri’s voluminous work as a sample. I don’t think the rest of the book has yet been scanned and posted online. In sha Allah, I hope to write up a separate post and review of al-Tajrid in the future. In reply to the point about the manuscripts of al-Khilafiyyat, then i can confirm from hearing Dr Abul Hasan Hussain Ahmed of London in his recent hadith durus conducted by sunnicourses.com, that he has in his possession two different manuscripts of the said work. One copy from the Suleymaniyye library (Haci Selim Aga manuscript) – this copy has missing sections and it was used by Mashhur Hasan Salman in his 3 volume edition of al-Khilafiyyat. The second manuscript is from the Qayrawayn Library in Fez, Morocco. This edition appears to be complete and it was not known or used by Mashhur Salman, since he didn’t mention it in his introduction. I am doubtful that he has finished the rest of the tahqiq as he didn’t mention using the second manuscript. I am also assured that Shaykh Abul Hasan will soon be mentioning some pro-Hanafi dala’il that are in the manuscript(s) of al-Khilafiyyat in a typed format with tahqiq. Bi-idhnillahi ta’ala. Does anyone know if al-Turkmani’s rejoinder to al Bayhaqi al-Jawhar al-Naqi is online? Does the al-Tajrid of al-Quduri also provide the evidenses or does it mention only the positions ? I read somewhere that it does NOT mentions the evidenses but only the qawls, how can it be then said that it is similar work as the Khilafiyyaat from the Hanafi side, as the Khifiyaat is with evidenses ?